I have quite a few recipes that are my go-to’s for days when I’m either 1) too tired to cook, or 2) I just can’t come up with anything more exciting. Most of them are one-pot meals that require a little prep and have a long cooking time. I like that. It gives me time to do other things like set a pretty table or make a beautiful salad while the main dish tends to itself. This Creamy Steak and Mushrooms is one of those old favorite standby recipes. It’s simple, satisfying, hearty food that is always enjoyed in our home. BeeBop really likes it. I mean, come on… it’s steak, mushrooms, and rice. That’s first cousins to meat and potatoes, right? Just kiddin’ sweetie. Start by cutting the steak into 1/2″ cubes. Make sure it’s nice and dry, blotting with paper towels to remove moisture if needed. Sprinkle all over with seasoned salt. I always use Jane’s Crazy Mixed-Up Salt, but any one that you like is fine. Heat the oil over medium heat in a heavy bottomed dutch oven. Add the steak and cook, stirring frequently, until browned. Remove the steak to a paper towel lined plate and set it aside for now. Into the same pan, add the chopped onions, garlic, and mushrooms and cook until the onions are soft and translucent. 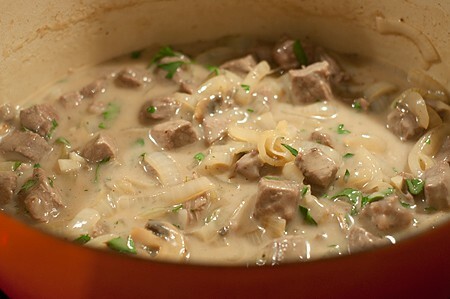 Return the beef to the pan, add the mushroom soup, water, parsley, and salt and pepper to taste. Cover the pan, place in oven and cook for 1 hour. 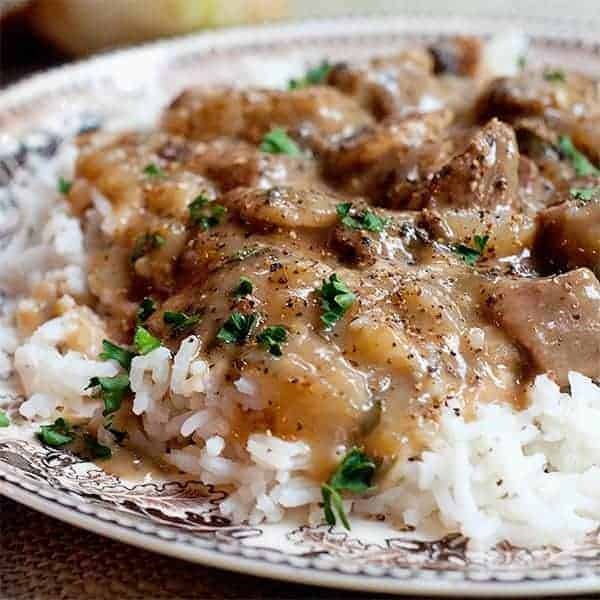 Creamy Steak and Mushrooms - steak tips in a creamy mushroom sauce served over rice. Quick and easy family dinner! Sprinkle the steak liberally with seasoned salt. 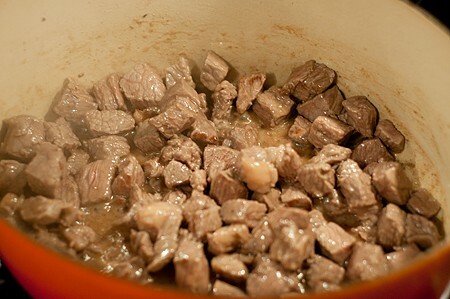 Cook beef in oil until brown. Remove to paper towel lined plate to drain. 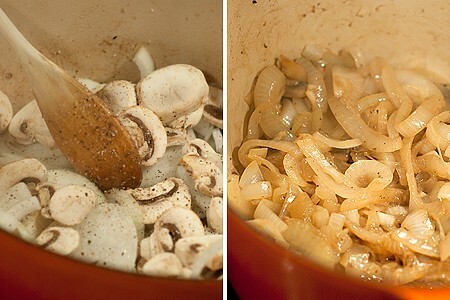 Add chopped onions, garlic, and mushrooms to the pan and cook until onions are soft and translucent. 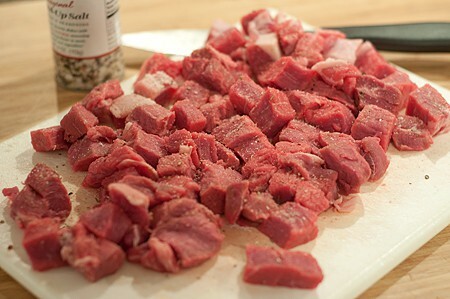 Return the beef to the pan, add the mushroom soup, water, parsley, and salt and pepper to taste. Cover, place in oven and cook for 1 hour. Beef Tenderloin Tips with Bleu Cheese Sauce from What’s Cookin, Chicago? Oooh, this is total comfort food for me!! For us, too, Deborah! And so good for the upcoming fall and winter months. I agree – this is perfect for a Sunday supper. Totally a comfort food meal! So homey, so good…and so YOU. Heck I would love the mushroom and onion mix even without the beef; this is sort of the perfect one dish meal. Funny you say that, Barb. Sometimes I do push the beef to the side and enjoy just the onions and mushrooms with the rice. I just love your dishes…..I am your newest follower because any woman that has these dishes has to be a good cook…LOL I have been collecting Johnson Brothers Historic America for years…. Serve it with egg noodles, and it becomes Southern Stroganoff!! I am so glad I found you while on Twitter this morning. It must have been a re tweet from someone. This is very much comfort food for me as it brings me right back to my childhood. I grew up in Minnesota, and family that grew up in Iowa. My Dad’s side ended up in Savannah, GA for many years so I also grew up with Southern Cooking. A midwestern w southern taste. What a great time of the year to have found you. Have you written a book? If not, you should…. I’ll have to do a little google search. Can’t wait to share some of your recipes with my Mom. Hi Ann. So glad you found your way here and hope you enjoy my recipes. To answer your question, no I haven’t written a book. People ask me about it all the time, though, so maybe I should start thinking about it! It looks comforting and delicious. That looks delicious Lana!!!! And – re: the book – Lana – you need to write one!!! I know I’d buy a copy as I’m sure everyone here would! Oh this is so for me! One pot meal? Easy? Comforting? 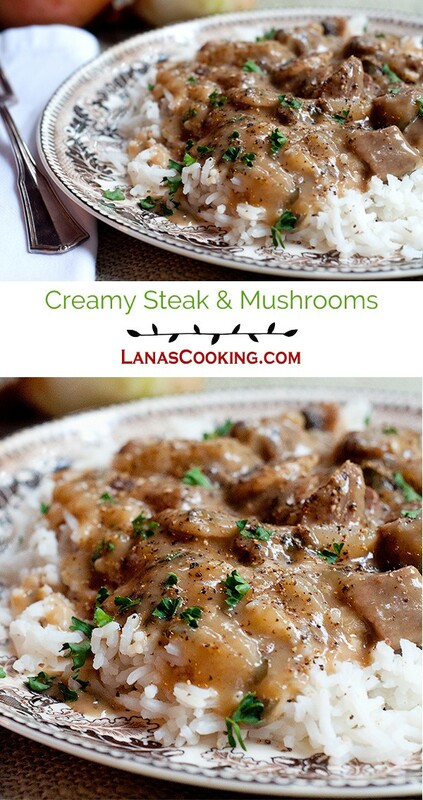 Love cream and mushrooms over meat and this looks absolutely delicious! Bookmarked! Have you ever tried this in a crockpot (leaving the rice out)? Just wondered how long to cook it in one, if so? Hi Kendi. No, I haven’t made this in the crockpot but it should be easy to do. Depending on your slow cooker, it would probably take 4 hours or so on high setting or 6-8 on a lower setting. I really hope you and your family enjoyed it, TJ. It’s one of our favorites. Great recipe, I added butter to the olive oil to cook the meat and green onions in with the rest of the veggies but kept the rest of the recipe the same. My husband loved it, had seconds, and was licking his fingers. Thank you! Wow this looks tasty. Love steak and mushrooms but put it over rice, yum!